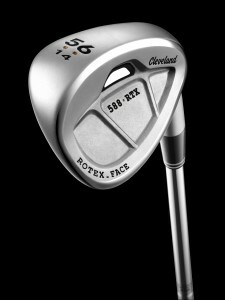 Coming off the heels of the relaunch of the new 588 wedges, Cleveland is announceing the new RTX CB line with their most advanced spin technology ever. The 588 RTX CB Wedges combine the legendary performance of 588 with added forgiveness and the breakthrough Rotex Face – Cleveland Golf’s most advanced spin technology ever. Developed closely with tour players, these U-Grooves are more precise and 16% larger to maximize spin on critical scoring shots – especially out of the rough, sand and in wet conditions. 588 performance with more forgiveness? I can get behind that in a heartbeat. I like that they kept the bounce dot system from earlier lines too. I wonder if these will use the Tour Concept shaft we saw in the 588 Forged? Pretty excited to hear how these perform! Sounds like a solid all around wedge. I have not had much experience with the Cleveland wedges so looking forward to giving this one a go. Pretty interesting tech on the milled face and how it affects open face toe shots. I am always excited with any release of Cleveland wedges, these should be a great offering. Id take the 588 with more forgiveness any day of the week! I still carry a CG14, which at initial glance, these remind me of very much. Cleveland makes arguably the best wedges in the biz, so I am looking forward to giving these a try. I have just one 588, but I have CG15 SW & LW. I don’t game them right now, but I’ll be looking at these!! Man that’s a great looking wedge. I can’t wait to get one in my hands to see what I can do with it. I’ve been thinking about some new wedges, these might be the ones that push that ponder to a reality. Can’t say I absolutely love the look from that picture. But I could sure use some help in the generating spin department. The 588’s already produce a lot of spin IMO, This sounds like it will help a good number of golfers wanting to generate more spin. Cleveland keeps bringing it. More spin? More forgiveness? Yes please! I really like my 588 wedge and to add more forgiveness and spin? Sounds like a winner to me. These are really nice looking also which doesnt hurt. Looking forward to seeing these in the golf shops. I look forward to hearing how these perform…definitely nice looking wedges. It really does have a CG16 feel to it.. I’m looking forward to seeing the black pearl! Looking forward to more pictures of this. I really like the design and since I was thinking of switching to Cleveland wedges I will have to keep a close look at these. I want to see this in person big time. I really loved the look of the 588’s. The CB look is cool and updated. Really digging these! Looking forward to testing this, thanks Cleveland! when CG marries 588, it can only lead to good things. Always love seeing whats new from Cleveland Golf and it looks like they came through once again. I can’t wait to get my hands on one of these soon. Wow, nice looking wedge! I could definitely use more spin from the rough, sand, and wet since that is where most of my shots seem to end up! Good blend of CG and 588 tech! Industrial in look, but with the 588 feel and more forgiveness then I am game! Awesome. Cleveland has really stepped it up… again!! I like these a lot. Wedges can be punishing at times so anytime I can get more forgiveness I go for it. The Rotex milling is the most interesting part for me. Nice advancement on the previous line with a few twists. Wish I could make up my mind on a new wedge set…not helping! Always liked the 588 and now its been improved, I don;t see how you can go wrong. Good looking wedges. Like the new features! I agree fellas, looks like a CG and 588 had a baby, looks good IMO. These look amazing, I can’t wait to see how this new face design looks, the laser grooves look awesome! These are going to be MONEY…..Can’t wait to hit one and see what kind of spin I can generate! Cool! I can see a 48* finding it’s way into my bag. Maybe a 52 and 56 as well??? Let the pondering commence…..